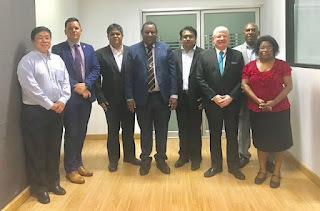 PNG Immigration and Citizenship Authority Chief Migration Officer, Mr Solomon Kantha has met with Thai Immigration Police, the International Organization for Migration and border management system vendors in Bangkok Thailand this week. Mr Kantha, who was returning from duty travel to the United Nations in New York, utilised the opportunity to explore further efforts to modernise and strengthen PNG’s borders. Speaking from Bangkok, Mr Kantha thanked Thai Immigration for accommodating his visit. Mr Kantha said ‘Thai Immigration is a strategic regional partner that has considerable experience combating human trafficking and other irregular migration activities. Thailand is also an APEC member and hosted the summit in 2003 – so their experience is invaluable to ICA’. During his engagement with Thai authorities, Mr Kantha was given a tour of the immigration operations at the Suvarnabhumi Airport in Bangkok. Mr Kantha said ‘it is privilege to see firsthand the operations used to process 90 million passengers on 140 different airlines, arriving into Thailand from all over the world. This tour reinforced what Minister Thomas and ICA already believe – modernising our processes is not only the way to attract more visitors to PNG, but it is necessary to maintain the security of our borders. We must utilise the technology that exists to support our responsibilities in protecting PNG, and ICA is committed expanding our capabilities into online visas, electronic passports and an integrated border manager system’. Mr Kantha said that movement into Advanced Passenger Information (API) information was an important first step that he will strive to deliver before the APEC Leaders’ Summit. Mr Kantha outlined the benefits and necessity of an API system by saying, ‘API is a global mechanism that allows countries to collect and analyse data on passengers before they even board their flight. Once a country has access to API, immigration officials and other law enforcement agencies can block criminals and other persons of concern ever getting on the plane. Such is the importance of API, the United Nations Security Council (UNSC) has made API system mandatory for all member states’. Mr Kantha concluded by saying that ‘I have received presentations by border management vendors that could implement an API system for PNG within 2018 and with little to no cost by PNG. ‘I will brief the Minister on my return to PNG on ways that ICA can implement API as a matter of priority to our national security and prosperity, said Mr Kantha’.